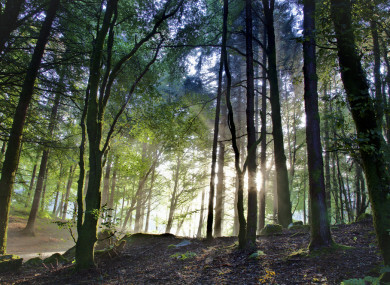 IRELAND NEEDS TO plant more trees, according to a new government forestry report. The Forestry Programme report says that the country’s tree-planting targets for 2015, 2016, and 2017 have been missed. Forests play an important role in helping fight climate change – Ireland’s forests and wood products removed 4.3 million tonnes of carbon dioxide from the atmosphere in 2015, for example. The government believes more tree-planting will also go some way to help Ireland meet its 2030 emissions reduction target, which it is on course to miss. According to the report, broadleaf planting has flatlined since 2015. The planting of conifers was increasing up to 2017, at which point planting fell 22% short of its overall target. Up to 2017, landowners chose to plant conifers over broadleaf trees. Total afforestation figures for the years 2015 – 2017 show that overall planting is 7% less than the target for these years. However, the shortfall in planting for native woodlands, agroforestry (the planting of trees on grazing lands) and forestry for fibre (the planting of trees for energy purposes – such as using the wood for energy sources or fencing products) – combined was much greater at 74%. The government offers farmers and other landowners payment for allowing trees to be planted on their land. And in a bid to encourage people to plant more trees, the government has increased the rates it will pay for broadleaves to be planted. The government said it will now pay premium rates to make the planting of certain forms of trees more “attractive to farmers”. Minister of State at the Department of Agriculture, Food and the Marine with responsibility for forestry, Andrew Doyle said the increase in grants will promote greater species and habitat diversity, adding that it will allow the government reach its broadleaf planting target of 30%. Agro-forestry will allow farmers to plant trees while continuing to graze their animals on the same land. This land use system would be suitable for producing woodfuel or, where appropriate, high quality hardwood timber. Then there’s the Forestry for Fibre scheme, which aims to boost the production of renewable energy for either domestic or local commercial use. Farm forestry presents a real opportunity for landowners to increase their income while continuing to farm. Planting part of a farm, perhaps the more remote or more difficult land with trees can introduce a new source of income while allowing landowners to maintain their existing output. There was controversy earlier in the month relating to the delay in payments to farmers from the state agency Coillte. The organisation said it would have to regain the trust of landowners who took part in the farm-forest partnership scheme and who went without payments for years. Under the plan, Coillte would plant land with trees and give farmers a cut of the proceeds when the forest was harvested. The government continually underspent its budget for its afforestation scheme from 2015 until the present day, with an underspend of some €22 million during the first three years of the programme. This underspend is being put down to the lower than expected demand from landowners. The allocation for 2018 is €106 million. Doyle said the new measures and increased rates will create the conditions for more forests to be planted, adding that he would encourage “seriously consider afforestation now”. Email “Ireland is way behind on its tree-planting schedule”. Feedback on “Ireland is way behind on its tree-planting schedule”.